If you get a water bill which much higher than normal, you need to consider the fact that you may be having a water leak in your house. You may not be able to see any water or flood but if there is a leak, you need to find it to avoid further damages. You can take some time each day to read the water meter and note all the numbers on the face of the meter both in the morning and in the evening. This will help you determine if you’ve any huge differences between days and probably call in detection services. Damp spots are signs of water and in case you cannot see damp spots, mold and mushrooms are signs of damp conditions. You should try to establish where your plumbing system passes through to estimate where the leak might be even before calling in a plumber. However, you should understand that damp spots may occur due to damp conditions resulting from water on the floor, ceiling or sprinkled water. Dripping or running water sounds are an indication that you have a water leak. If you hear or see any of these signs, you should hire a plumber ASAP to repair or replace your plumbing system. However, you may not be able to hear dripping or running water especially in the basement. Therefore, if you’ve a higher water bill, smell or see damp spots, seek help from a professional water leak detection in Queen Creek, AZ. 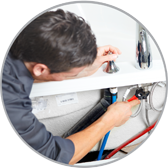 These professionals are skilled, experienced and equipped to detect a water leak in your home.